Formación de palabras y enseñanza del español LE/L2 offers a unique combination of theory and practice that guides the reader through the main processes of word formation in Spanish. 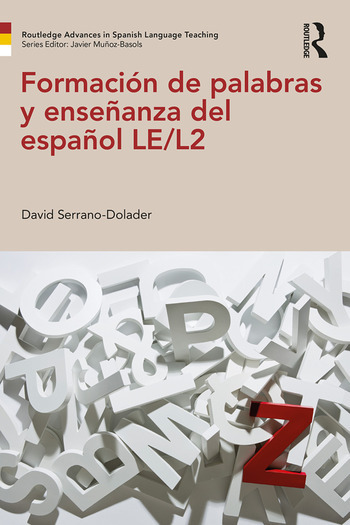 It provides a detailed analysis of the role of lexical creation in the acquisition of L2 Spanish vocabulary, as well as over a hundred practical self-reflection activities. • Guidelines on how to tackle the teaching of Spanish word formation and vocabulary in an effective and engaging way. Written in a clear and accessible manner, Formación de palabras y enseñanza del español LE/L2 is an essential resource for teachers of Spanish at all levels. It is also an excellent reference book for language teachers who wish to integrate word formation into the teaching of the Spanish language. 2. ¿A quiénes va dirigido este libro? 5. ¿Y de qué más (no) se ocupa este libro? 3.1. El vocabulario: ¿qué significa "conocer" una palabra? David Serrano-Dolader is Professor of Spanish language at the University of Zaragoza, Spain.